I bet the kids would not say that any of this was EASY…. 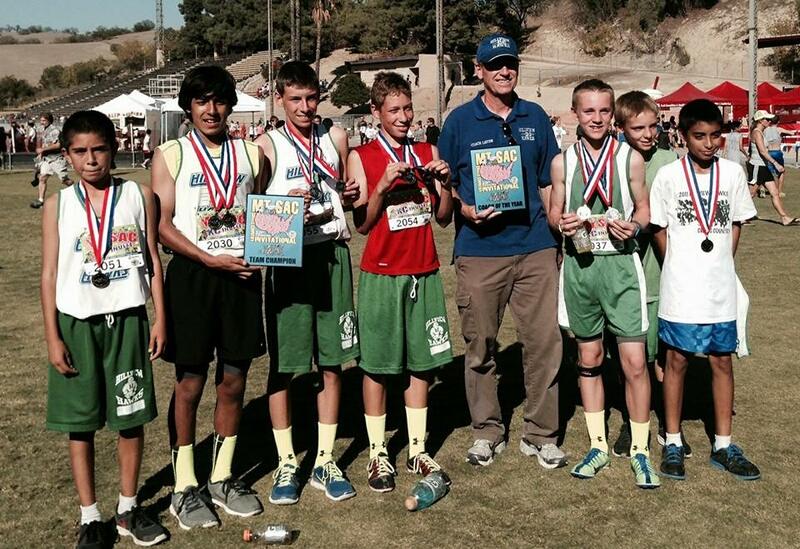 1) The 8th grade boys race – The first race of the day was the 8th grade boys. They lined them up single file and off they went. They start heading west and make a left turn to go up and over Reservoir Hill. I ran to the back side of the hill to a spot where I could make them out as the crest the hill and then yell some encouragement. At the top I spotted one kid already running away from everyone. I spotted 2 red shirts, 4 or 5 others and the Leo, with Cade close behind. I yelled. I soon spotted that Bryce and Cole were doing well as well. I backtracked down the path so that I could see them as the make a right turn onto the flatter loop in the middle of the race. The two red shirts were Palos Verdes, so I was a bit concerned. Leo and Cade were making their way through the intervening runners. Bryce and Cole were looking good, within the top 20. Michael and Luis, our normal 5 and 6 guys were back a bit. On the far side of the loop it was still, the lone guy, the two PV guys and now Leo and Cade. Bryce and Cole were now around 15th in a pack. Luis was steadily making his way up through the pack. There were a lot of those red shirts though… Coming into the finish, Leo and Cade held those 4th and 5th positions. Bryce and Cole snuck into the medals at 14th and 15th. Luis had worked his way all the way up to 25. Hillview won with a score of 56. Palos Verdes was second with 76. The team time was 1:02:54, about a minute off of the course record. 2) After an 8th grade girls race that did not go so well…. no medals, 11th place out of 15 teams…. oh, I should note that Mariah Castillo from Joe Walker won the girls race and the Joe Walker team got 2nd. Good Job Joe Walker….. now back to the Hillview report. After the 8th grade girls was the 7th grade boys. Once again, Palos Verdes looked to be the main competition. Adam Deshields ran strong and finished 4th. Derek Rodriguez was 5th and Ben Sumner was 12th. The #4 guys were Abraham Soso-torres and Chigozie Achara at 17 and 24. This was a great finish, but Palos Verdes was a bit better. PV won with 44 point to our 60! Still, the team and the coaches were thrilled to come home with second placque for the team and some individual medals. 3) After the 7th grade boys, the 7th grade girls ran. Natalie Gutierrez had an incredible race. There was a PV girl who ran away from everyone, but Natalie steadily worked her way to the front of everyone else and stayed there. She won 2nd place, the highest Hillview finisher of the day. Typically Kiley is our number two girl and she seemed just a bit off, but Josie battled strong all the way to the finish. Josie placed 10th and Kiley 17th. The number 4 and 5 girls were Brooklyn and Tanaya. Early in the race they were way back but they did slowly work their way forward. Brooklyn finished 39th and Tonaya 56th. Still the team won 3rd place!! The 6th grade teams were not as deep this year. Hillview only had 90 or so 6th grade students as a special ‘academy’ Brady Butler was the only 6th grader to win a medal with a 4th place finish in his race. The boys were a respectable 5th place overall. The girls who only had 5 runners, were 15th. One other highlight of the day was getting to see the new Mt SAC Cross Country Invitational Program. I went right to the course records page. Sure enough, there we were!! 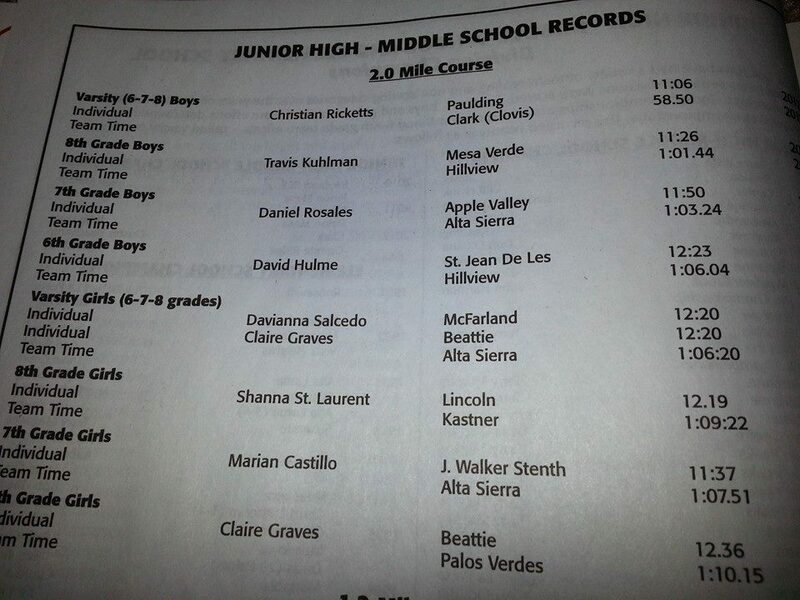 Last year we set two team records for total time in 6th grade boys and 8th grade boys…..
Congratulations to all the Hillview runners and coaches! Seeing Hillview twice in the Mt. SAC record book is really cool. Great job!